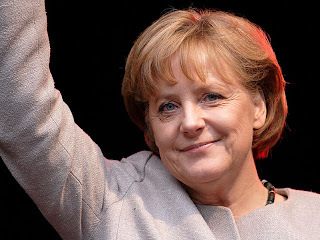 Today Germany held its general elections, the Bundestagswahl 2009, which confirmed Chancellor Angela Merkel for another four year term in office! The Big Coalition formed by Germany's two biggest parties that governed the country for 4 years is now history. Instead, Germans voted for a "Black-Yellow" coalition of CDU (Christian Democratic Union - Black) and FDP (Liberals - Yellow). Merkel's leading party, the CDU got 33,8 % of the votes, with the FDP (led by Guido Westerwelle) getting their best-to-date election-outcome with 14,6 %. A majority, that Social Democrats together with the left wing party and the Green Party could not have beat. The loser in this general election is the SPD (Social Democrats), which only got 22,9 % - 11,3 percentage points less than they had in the last election. The SPD was also the governing party, when Gerhard Schröder was Chancellor. It's their worst ever outcome, and out of 222 mandate seats they had in parliament, they will only have 147 left. SPD Chancellor candidate Frank-Walter Steinmeier called the outcome of this Bundestagswahl a "bitter defeat". The real winners were the Liberals, though. During the last election, they got 9,8 % of the votes and 61 seats in parliament. From now on, the FDP will have 93 seats. However, only 71,7 % out of the 62 million Germans registered to vote did so today, which is the worst ever voter participation in the history of the Federal Republic. This may also have to do with many, formerly loyal SPD voters denying to vote for the party. If I may undertake the task of judging this election... BOOO! 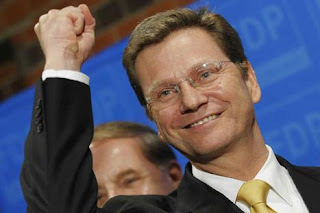 Merkel as German Chancellor is a pity, but Guido Westerwelle as our foreign minister? Imagine him meeting Putin one day...! Honestly, our happy little Guido will just be pushed around by all the other big, bad professionals. Oh come on, give him a break! 14,6 % think that the FDP is up for the job! Besides, I do think that Germany needs this change in coalition. I'm not convinced Steinmeier could have done a good job as Chancellor! I didn't say Steinmeier would've done a good job. And I personally think a guy of which only 14.6% think he could do it should definately not be appointed vice chancellor, nor foreign minister. I voted for the Greens, and probably "wasted" my vote, but, although I am a member of the SPD, I do not support the political direction they currently have been taking (Hartz 4 = social? not really!). I just think it's a shame we have to resort to people like Westerwelle - I'm sure Steinmeier was a better choice for foreign minister!